Fishing for Barracuda, the Tiger of the Sea, is an exciting opportunity. With an aggressive behavior and high flying acrobatics, the barracuda is a favorite catch of anglers. 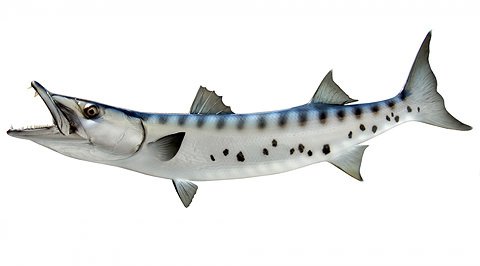 The Barracuda is known as "The Tiger of the Sea" but also carries a variety of common names; Commerson's Sea pike, and Short barracuda are all common English language names. It is a nosy, intrusive and aggressive predator. The Barracuda provides the angler with an impressive aerial display often jumping several times its own length. The saber-like teeth are extremely sharp and dangerous if not handled with caution. The Barracuda is a fish that can be found worldwide in near shore tropical and subtropical seas (30°N – 30°S). The great barracuda is common in the western Atlantic Ocean from Massachusetts up north to Brazil down south. The Barracuda can also be found in the Gulf of Mexico and the Caribbean Sea as well as the eastern Atlantic Ocean, Indo-Pacific, and the Red Sea. It is rare or absent in areas of the eastern Pacific Ocean. Distinctive features of this fish include a slender, streamlined body that is round in the mid-section with the top of the head between the eyes nearly flat. The mouth is large, containing loads of large sharp teeth and a projecting lower jaw. The pectoral fin tips of the barracuda extend to the origin of the pelvic fins. The spinous and soft dorsal fins are widely separated and the double emarginate tail fin exhibits pale tips on each lobe. This predator has a body coloration that is brownish or bluish gray on the dorsum and upper side, with a greenish cast shading to silvery on the sides and a white belly. Often the upper side has 18-23 dark bars most often evident when the fish is quiescent or over a variegated substrate. The black spots on the lower sides of the great barracuda distinguish it from other species of barracuda family.